If you're new here, I'd like to invite you to try a Free Week Of Unlimited Training. -> CLICK HERE <- to sign up. #throwbackthursday – One of proudest moments. February 18th, 2006: The day I received my Brazilian Jiu-Jitsu Blackbelt from my instructor Romero Jacare Cavalcanti. It was a dream come true! My BJJ journey was a long one starting back in 1994 –after UFC #2– when the only way to learn the art was to study VHS tapes, read magazines and take advantage of the rare opportunity to attend seminar with the Gracie Family during the two or three times they visited Canada back then. Fortunately the lack of instruction in Canada at that time didn’t stop me from wanting to learn; Truth be told, I had become insanely hooked on Jiu-Jitsu after watching Renzo Gracie demonstrate a basic arm lock on Craig Kukuk in his instructional VHS series. I taught myself for the first four years by drilling techniques every day with a different student of mine during the daytime hours. Other times I locked myself in my bedroom and documented every single technique I came across. My BJJ Technique Book grew to over 1000 pages. Two nights a week we added grappling classes to our schedule at Joslin’s. Our Karate students and I would practice and roll a bit during those times but we were very inexperienced. I still remember the first two times I tapped out were because I was squished underneath a 300+ lbs training partner and couldn’t breathe, lol :). We had portable mats that we had to be put down before class and put away afterwards. My Dad even joined in on the training with us. After a few years we progressed to become a pretty scrappy bunch of grapplers. In 1998 I traveled to Atlanta, Georgia to train with Romero “Jacare” Cavalcanti after hearing about his school from a Doctor I met in Chicago. I graded for my Blue Belt during that visit after battling his BJJ beasts. I’m very proud to say that over the next decade I earned every one of my belts from Master Jacare. The lessons I learned at Master Jacare’s school were game changing. I brought them back to our school, added them to our curriculum and continued to train like a madman. Team Joslin’s was growing quickly and our skills were improving all the time. 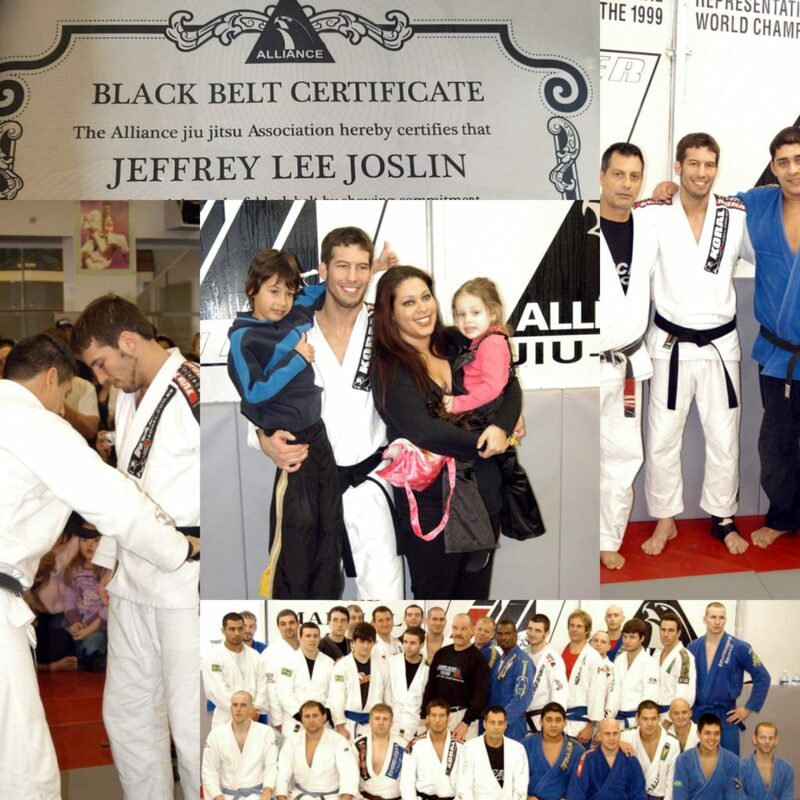 In 2002, we had Black Belt champ JoseMario MacCord Queiroga Esfiha teach classes at Joslin’s for over a year. I learned so much during that period of time. Esfiha was a big guy that could move as fast as a light one when he wanted to. I was a purple belt and the experience and details I gained from my friend “Esfiha” helped me win Gold at the IBJJF Pan-American Championship that year. The beautiful thing about Martial Arts is that the learning never ends. We’ve had many amazing guests teach at our school and influence our BJJ game over the years. Marcelo Garcia spent over a month with us back when I was a brown belt. That was deadly! When Master Jacare wrapped the Black Belt around my waist in 2006 it didn’t feel like the end. It felt like a new beginning: My motivation to learn more and improve became even stronger. 12 years later I still have so much to learn and am excited to continue this journey.